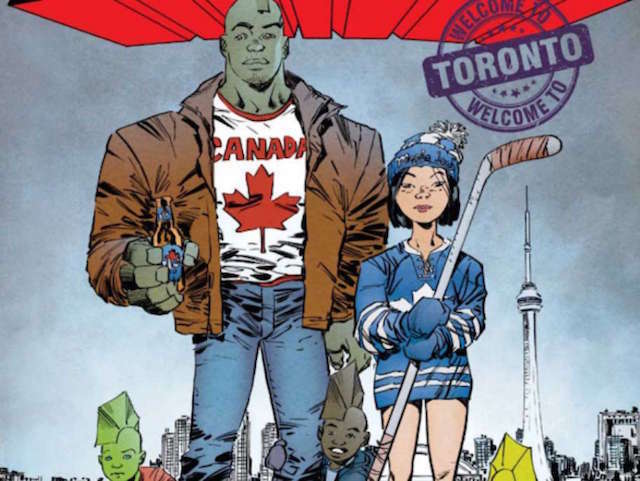 Erik Larsen's Savage Dragon will tackles some pretty heavy ground in this week's issue, and Larsen has joined ComicBook.com to discuss the issue. Spoilers ahead for Savage Dragon #226. Ever since Savage Dragon became the first mainstream comic book to directly address the election of Donald Trump to the U.S. Presidency, fans have wondered how long it would take for his Presidency to make a mark on the book. In today's Savage Dragon #226, the answer came in the form of a law that banned extra-terrestrials, including series lead Malcolm Dragon, from the United States. 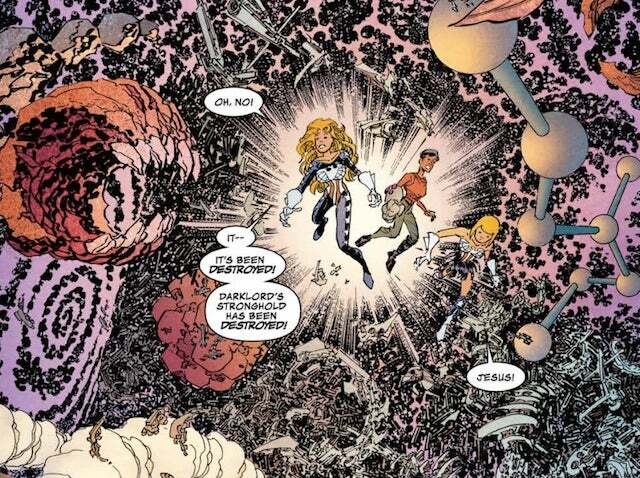 The issue begins with the fallout from "The Merging of Multiple Earths," a three-part storyline that saw, among other things, the death of Malcolm's father, the original Savage Dragon. As it moves along, though, it is the fallout from a Trump executive order banning aliens that starts to really shape the issue...and presumably the title's future. SELF-CONTAINED ISSUE: “TRUMPED" When a tyrannical madman assumes command of the United States, aliens are deemed a threat to national security and targeted for elimination—and that includes Malcolm Dragon and his family! With a country turned against him, Malcolm Dragon fights as he’s never fought before! ...although the President himself only appears in a couple of pages and in general his portrayal did not differ from the way other Presidents have been in this and other comics: his actions have consequences, and the main characters certainly do not like them, but Trump was not depicted as doing them for "evil" reasons. If you have not yet read Savage Dragon #226, you can get a copy at your local retailer or a digital version here and read along with us. Okay, so right out of the gate: Some of this imagery feels awfully prescient in light of Charlottesville. To your mind, was it just kind of a matter of time before something like that happened? There does seem to be a certain inevitability of it all. We kick off with Dragon's funeral and the reactions run the gamut. Obviously we get to the "trying to bring him back" stage eventually, but did you want to get it out of the way up top that some people simply wouldn't believe the death? Well, sure. 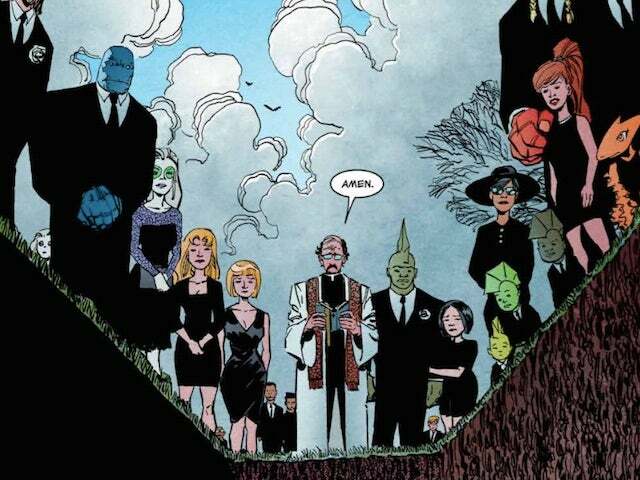 For a few character present, this is their third Savage Dragon funeral. It’s only natural that some are going to feel a bit doubtful that this time it’s really going to stick after the other times where it clearly didn’t. It’s actually something of a running gag as I’ve used the same exact drawing of the coffin, the hole in the ground and priest for all three funerals. We catch up with some characters at the funeral: is that planting seeds for the near future, or more just an opportunity to check in on some people, since a funeral is going to bring everyone together? It’s all of the above, really. Funerals bring folks together and it’s a chance to touch base with a lot of characters. I could have spent a lot more time at the funeral as there’s a lot I didn’t have space for. Obviously Malcolm's feeling that being a natural-born citizen would protect him is misguided, but it's also not unlike what we are seeing in real life with the children of some immigrants. Is that where the inspiration for this story came from? Malcolm came here through Dimension-X, so he’s actually not of this Earth. Not really. But, yeah, the whole anti-emigration/anti-illegal alien thing was the genesis of the story. I know it was only for one panel, but is it difficult to keep up with Trump's constant staffing changes so you could draw the background for his cameo? I literally printed out a photo blue line and inked it. The others were whoever they were in the picture. I don’t imagine most people are really keeping track of who’s coming or going and there’s no way to ensure than whoever I drew into the panel would still be there. I honestly wasn’t sure Trump himself would still be in office when I started this thing. Some of the more unlikely signs/shirts/whatever in the pro-Trump protests are actually things I have seen in real life. What is the balance of things you created for the story to things you just plucked out of the real world? I tried to play as fair as possible. I actually combed through a lot of photos and went through a lot of posts on Facebook, Twitter and YouTube to grab comments from supporters. Much of the dialogue from Trump supporters is authentic and many of the drawings of supporters were based on actual people. The more inflammatory something is, the more likely it was said by an actual Trump supporter somewhere. And much of the general praise from supporters was real as well. I wasn’t just cherrypicking the juicy stuff. Since it feels kind of timely, any chance we will see Baron Blitzkrieg back anytime soon? It’s not unlikely. Still, I do have to wonder how committed today’s Nazis actually are to the cause. I mean, really, are these guys serious or are they just throwing swastikas on things because they’re trying to be shocking or cause a stir? Would these guys really round up people and march them off to the gas chambers? Because if they are—they should be rounded up and locked away from decent people. When you were talking to the Savage Fincast last month, they noted that in the wake of The Merging of Multiple Earths, the fear from the public and even Trump seem somewhat understandable. Is that something you want to explore a little? I’ll touch on it as much as I can. I don’t want any of it to come off as too heavy-handed or preachy. The point of this story was not to say that Trump is a bad man but to instead focus on the wake caused by his knee-jerk decisions and flippant remarks. Giving extraterrestrials the heave-ho is an understandable position to make but you can end up throwing the baby out with the bathwater. Malcolm Dragon has done a lot of good. That’s a big part of it but in addition to that--she does love him, even if his heart wasn’t necessarily hers in the end. At one point they were very much an item. Was there a particular inspiration for the Trump supporter splash page? Obviously the cover had a specific source and the splash feels similar to me. I traced photos every time I drew Trump in the issue. I didn’t want to caricature the guy. I wanted to play as fair as I could in regard to his depiction. I found an appropriate shot and printed it out and inked it. Strangely, the conversation about at-will employment is also once gain very much a thing we are talking about post-Charlottesville. Is Kevin physically capable of doing something super (hero OR villain) at this point if his other options dry up? He could, conceivably. He’s more fragile than he was at his peak but he’s no creampuff. If it came down to blue-collar manual labor stuff, he’d be pretty good at it. This isn’t a life-ending situation by any means but it is something of a setback. Malcolm's first instinct is to say the executive order is likely unconstitutional: is his trip to Canada planned as a temporary measure while he fights it or, as far as you're concerned, is that going to be the book's new home base? The plan is for it to be his new home base for a while. Whether that’s a few months or a few years is still somewhat up in the air. I don’t have a strong desire to write and draw a courtroom drama so fighting it out in court isn’t something I’m considering. Others will challenge it, of course, but Malcolm has his family to look after. The other side of that: obviously he would still face charges, and have a hard time getting a fair trial, stemming from the fight with the feds. Did you include that in part to give a legitimate reason why leaving the country NOW made sense? Somewhat, yeah. And I didn’t want Malcolm to be running away especially. A lot of folks say, “If this person or that is elected—I’m moving to Canada” but that’s a pretty hollow threat and running away is a cowardly act. Better to stick around and fight if you can. In this case—he really doesn’t have that option. Throwing on a Power Glove and throwing in with Jennifer and Angel seems like a big move for Alex. Will we get into how she reacts to the revelation that their plan to bring back Dragon is a non-starter? Oh, sure. This adventure is far from over. Alex has worn the power gloves in the past and even worn Battle Tank’s armor for a while, so she’s fairly capable. But to answer your question—yeah—we’ll get her reaction this this and all kinds of stuff. Will we be seeing more of the girls in Dimension-X, or now that they see the stronghold is gone will they be hurrying right back? Next time we see them they will still be in Dimension-X. It gets a bit more complicated next issue. You’ll see what I mean when we get there. With Malcolm's arrest, was it difficult to figure out exactly how to do it? I feel like the other cops being characters we already know and care about makes swallowing this behavior from them a little harder to watch. It’s all difficult, honestly. You’d think after all these years that this would get easier but it just doesn’t. Everything is a challenge. I’ll draw and redraw some pages a dozen times trying to make things play out in a compelling way. There’s a lot of hemming and hawing when I work. A lot of trial and error. I’ve been known to put pages in a different order in the 11th hour because the flow wasn’t what I wanted it to be.